this weekend was filled with bee action. 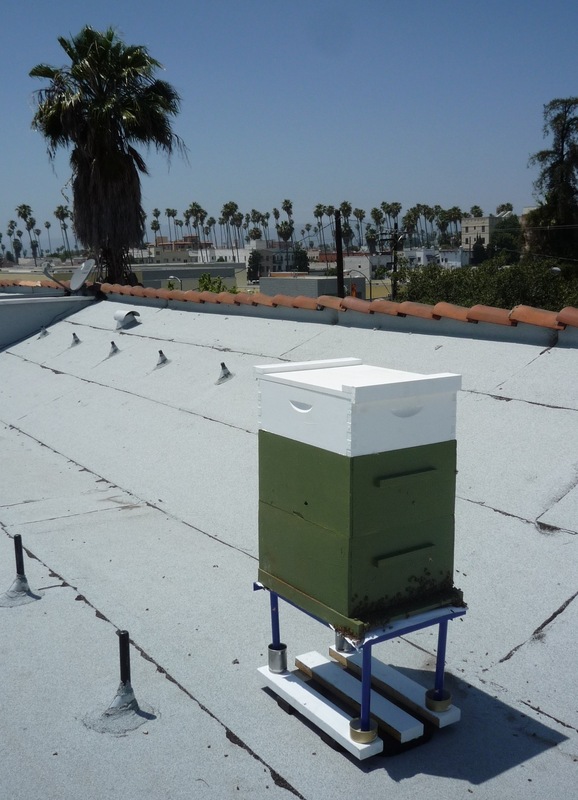 we saw a talk with Kirk Anderson from the Backwards Beekeepers, we went to see Erik’s beehive (The shop-vac beehive itself) and with his gracious help we transported a beehive to our roof. our friends Fernando and Hazel are moving to Argentina so they generously gave us their established beehive. the move was interesting and challenging. we tried to tape some mesh to the entrance at night but we failed, there were too many “bearding” outside of the landing pad and they got really angry so we decided to rethink our strategy. not wanting to carry an angry beehive through the halls of the building with escape holes haphazardly closed with duct tape. i made a large bag with vinyl and mesh and we did it in two steps: first, we smoked them during the day and carefully slid the bag under the hive. then we came back at sundown, smoked them again, and pulled the bag over the whole thing as quickly as possible. that made it safe to transport. we left a “nuc box” behind to catch the stragglers. it was quite the operation. the picture on the left is the hive in its new home with the customary L.A palm tree in the background. the white box on top is a new addition. the green boxes below where built by fernando himself. the bees are getting used to the new location. It’s so exciting to have our own bee hive! Thank you so much Bobby and Federico! The videos are very meditative.